Check out the video of Valery explaining why he didn’t undergo the transplant. A severely disabled Russian was supposed to become the first-ever human to have his head transplanted onto another person’s spine has backed out of the procedure saying that his responsibilities as a father made him reconsider. Valery Spiridnov suffers from the muscle-wasting disease Werdnig-Hoffman which is a type of spinal muscular atrophy that usually leads to low life expectancy. However, the 33-year-old has married a glamorous wife and they now have a “beautiful kid” who was born in November. The thought of leaving them for even a few months to undergo the transplant procedure has been unbearable. The computer expert, who now lives in Florida, told Good Morning Britain that he is backing off from the treatment because of his wife Anastasia Panfilova, who has a masters degree in chemical technology, and their baby son. He added that the treatment should give priority to those who are terminally ill.
Italian doctor Sergio Canavero, the man who is at the head of this pioneering procedure, insists that severance of a head from the spine does not mean death. 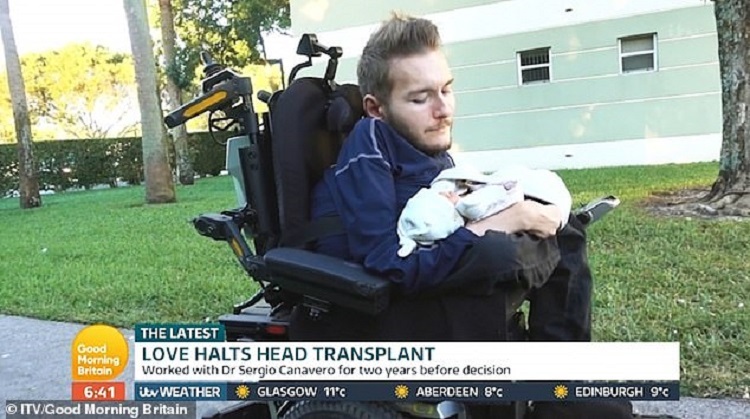 He has performed head transplant procedures on monkeys and discovered that they are still able to send signals to their limbs and carry on as they did before the transplant. Dubbed Dr. Frankenstein, Canavero is currently conducting his research in China. He had announced in December that he would not be pursuing the treatment but only recently revealed that his unwavering commitment to his family is the reason. 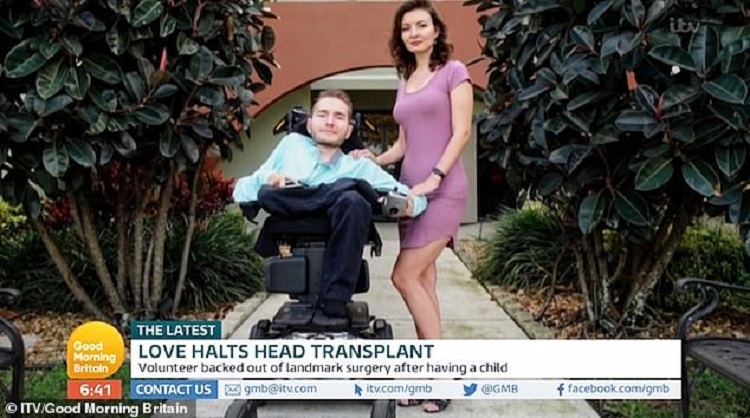 While he won’t be having head transplant surgery any time soon, he still hasn’t ruled it out entirely especially if someone else goes first. A few months back, he had voiced concerns that something had gone “wrong” in Dr. Canavero’s research. Not only that, Spiridnov says his son is a “miracle” because the child was born healthy despite the hereditary nature of Werdnig-Hoffman. His wife religiously underwent tests throughout the course of her pregnancy.